Summers always brings back memorable memories of school days when we used to wait desperately for our summer vacations!! I always used to accompany mom to buy green mangoes for making various sweet and spicy mango pickles. We used to make around 10kg's of mango pickle every year. Most of which we would share with our aunt's and uncle's families nevertheless it was fun to watch my ma and grandma making those yummy pickles. It was like a ritual which we used to follow every single year! When we are talking about summers, how can mangoes be left behind? Mangoes are probably the most loved fruit of all time and hence no wonder given the title of "King of Fruits". Honestly till date I feel its over exaggerated! Friends who know me better will know that mango is not one of my favorite fruit.Honestly I would skip it all the time but sometimes my mom corners me and I have to eat it purely out of guilt as my mom uses her tactics of letting me know how expensive these mangoes are :( On recent visit from my family ,dad got around a dozen mangoes for me! You know how parents feel about their kids living in a different city and not getting proper nutritious food. I couldn't really send them back...and a good girl I am I promised to eat them all...almost!. 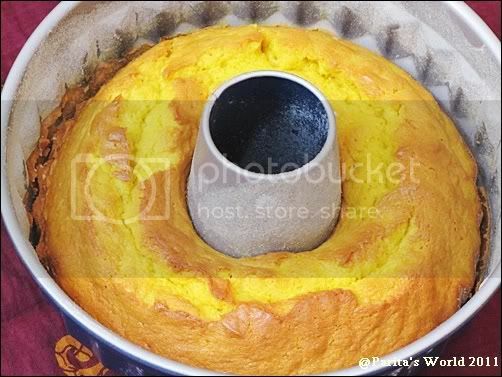 I always wanted to try my hands on making a mango cake so what better way to use those plump and juicy mangoes than baking a pound cake out of it? 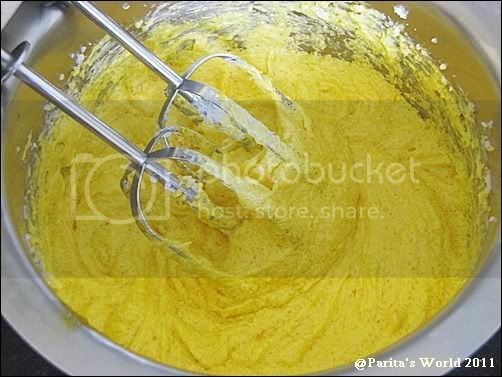 Now add in the mango puree and beat until well combined. The texture and color of the mixture would be light pale yellow. 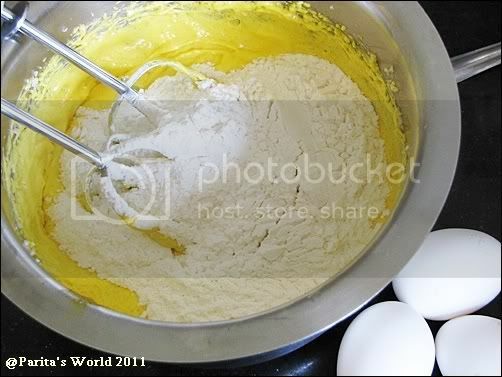 Now beat in one egg at a time alternating with flour mixture. I used 4 eggs so started with an egg and ended with an egg. Finally add in your vanilla essence and beat lightly just until its incorporated. 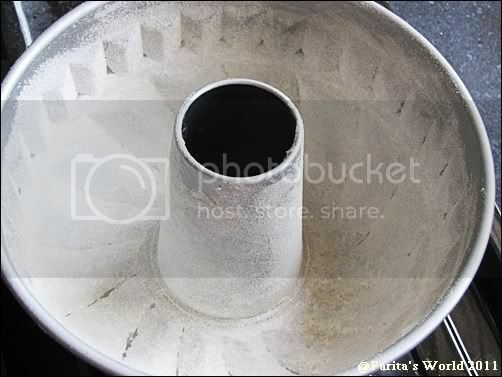 Preheat the oven to 180 degrees C and grease and flour a pound cake tin. 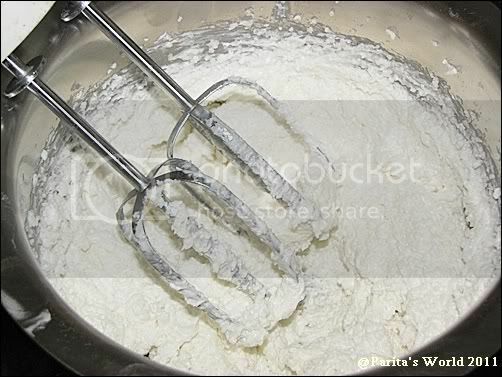 Pour the batter into greased cake tin and tap lightly on the kitchen platform so that the mixture is evenly spread. 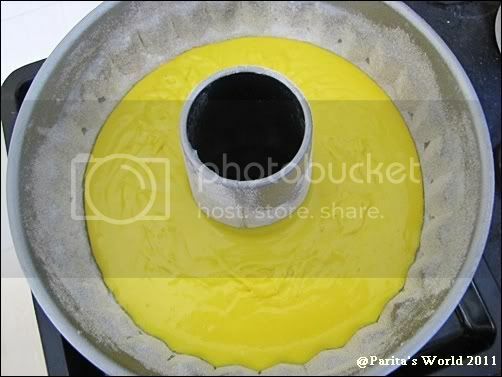 Bake the cake for 45 to 50 mins until a knife inserted comes out clear. My cake was baked in exactly 50 mins. Remove the cake pan from oven and leave it to cool down completely. Once the cake as reached on room temperate, slice the cake and serve it with a dollop of vanilla ice cream or cherish the flavors of mango as it is! Verdict:- One of the most softest cake I have ever made! Next time I will add in some roasted nuts to get some nutty flavor in the cake. Definately a keeper recipe! All mango lovers must try this for sure! wonderful recipe, I too tried Vegan mango cake from Champa, it was heaven, should try this one too. That looks so summery, bright n delightful ~ Stunning pound cake! cake looks delicious,..perfect for summers,. No matter how old we become parents will continue to behave as if we are still their chotta bachha :-)I'm crazy about mangoes. Enjoying the season. lovely cake with great texture. Lovely colour and the pan is a beauty too!! 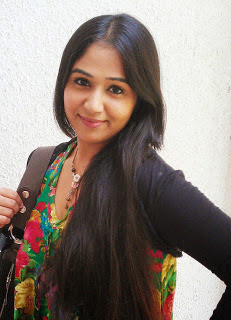 lovely one Parita :) Stumbled upon your blog thru FB's bloggers Cafe !! lovely texture.. Is there a way I can make this without eggs?? Wow,wonderful cake,look at those bright yellow mangoes! What a beauty,yummy! 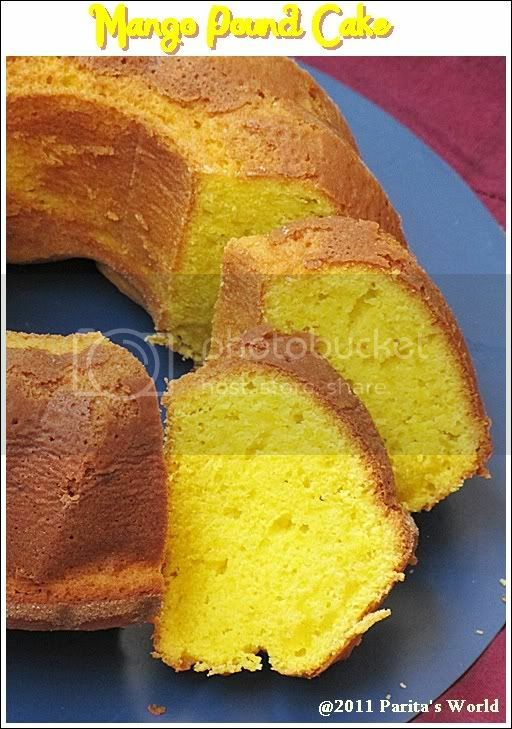 Omg, look at that beautiful prefect looking pound cake,marvellous..
Cake looks awesome,can we add mango essence? Super irresistible cake, looking so gorgeous. And the recipe is very easy to follow. Thanks! Wow .. what a beautiful pound cake .. pictures are awesome ..
First time here and love your space. Cake looks absolutely yummy and with mango, it must be lipsmacking! Loving that rich yellow color and mango flavor - YUM! 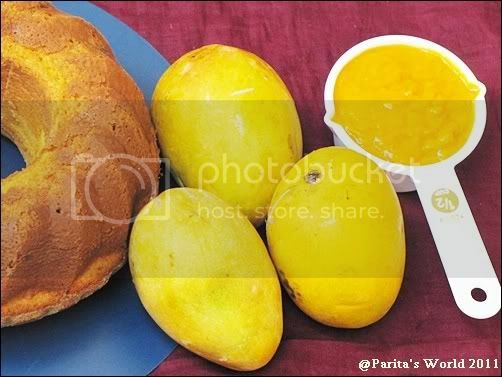 Hi Parita..just baked this goodie wt aphonso..the aroma is awesome..my son entered home sniffing, got to know I m baking wt Alphonso, so said..why r u using MY mangoes :D I love to hv juice, milkshake n simply :) I bet he will b the one to have max share! :D Tks for this lovely recipe!! Parita, thanks for this recipe, v enjoyed the cake yesterday, all of us loved the taste, texture, flavor..i hv even shared wt frnds. Tks for posting. Keep posting such treats! 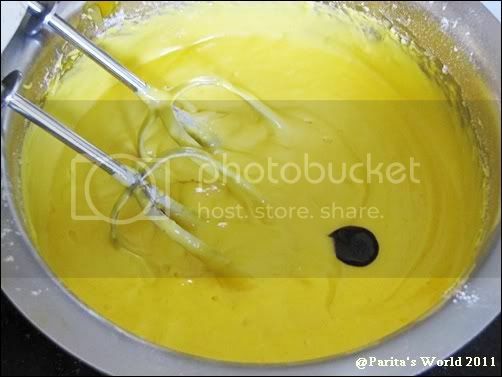 Parita this mango cake looks awesome, perfectly baked. What a perfect color, mangoes are abundant now, right timing! Everywhere its mangoes, mangoes and more mangoes. I love this season a lot. This mango cake looks yummy and delicious . Will try this soon. i wish we could taste it online...hehe. you got one of the most delicious blog sweety. That looks delicious. I haven't really played with mango as a baking ingredient too much, but looking at this, I just know I should! Looks so tempting and delicious.. Amazing color.. yummy !! Looks absolutely fantastic Parita! I must must try this before sometime real soon! That is one colorful mango pound cake. And looks very moist as well. thanks for sharing this healthy recipe. i love mangoes and i really wanna eat some mango cake. thanks for posting. keep on blogging. God bless! What a vivid yellow colour! I hope I could achieve it too! 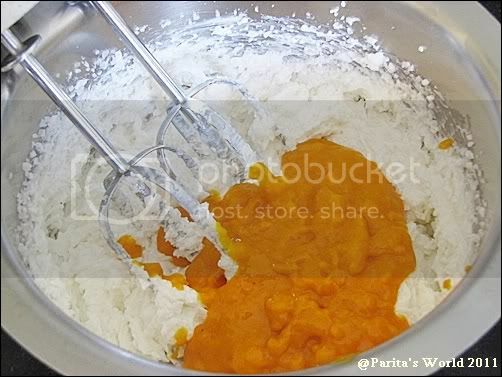 I think there is too much flour in this recipe..and it isnt sweet enough..totally depends on how sweet your puree it. I omitted half cup of the flour and tried it. I think a lil lesser baking soda would be great for this recipe.